Stonefish may be a nightmare for the divers, but fish with ugly and deadly form that was able to reduce the level of rejection of transplants in the Cancer patients. The scientists found similarities between the Stonefish deadly toxins, and how the human immune system reacts when they rejected a bone marrow transplant. These findings are particularly surprising given the Stonefish has a bad reputation. "If the sting does not kill you, it will be Stonefish can cause tremendous pain to be paralyzing and may even turn off the body's tissues and therefore the most likely members of the body that need to be amputated." Jamie Seymour, an associate professor from James Cook University who specialises is venom, said the pain of Stonefish stings was excruciating. "Stonefish is one of the few animals that we know will only use the poison for defense," he said. But these fish were able to help scientists to understand more about the human body. 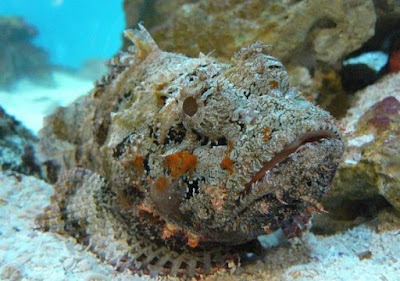 Professor James Whisstock of Monash University said the Stonefish venom contains a perforin protein which has the ability to make a hole in the body's cells. "We were shocked to find the protein content in this Stonefish was associated with the main weapon used by the human body's immune system in eliminating cells infected by viral and malignant as cancer cells," he said. The response of the immune system plays an important role in thwarting up to 30 percent of bone marrow transplant, which is used in the treatment of leukemia. So understanding how these proteins form pores may help scientists find ways to prevent the formation of pores as often as possible, particularly through the development of the body's immune system suppressants. "It gives us an idea of ​​how this protein can assemble into larger and form a ring-shaped pores," says Professor Whisstock. And the information on the structure of the Stonefish toxin, it turned out to actively inform us of drug discovery programs that occur at this time. Structure of the Stonefish venom really gives us some fantastic information about how to develop a molecule that is better to prevent the immune system to function when we're not wanted, for example, reject the transplanted organ. Professor Seymour said the poison may occasionally contain important information and possibilities that need to be explored. "If you could find out what exactly the structure and components of each of the pieces in this poison, then we can examine the structure and eventually discovered a new compound from the poison," he said.